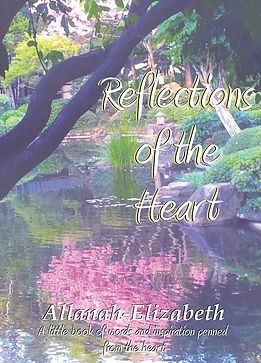 Inspiring, contemplative and alluring, ‘Reflections of the Heart’ is an intimate collection of poems and messages that will move and transport you, taking you on an inward journey, to unveil the strength and beauty of who you are! Click here for a signed copy with a personalised message from Allanah-Elizabeth. From your very first steps, that first kiss, the tears you’ve shed, the smiles you’ve shared and the hearts you’ve touched – It is a reflection of your true being. Allanah-Elizabeth, author of ‘’The Power of Poetry’, will again captivate and awaken you with her beautiful words, artful storytelling and vivid imagery in ‘Reflections of the Heart’, leaving you to fall in love with yourself all over again and SHINE from the inside out.